I was so excited when this Front Cover Set arrived because I love the 'smoky eye' look but I sometimes struggle to know how to get it right. This set provides full 'equipment' to get yourself 4 different looks along with step by step instructions from a professional make up artist to help you along the way. Don't worry, it looks complicated when you see the box but it is so easy and the results are stunning - even if I do say so myself! All these pics are of me, well.. my eye - they are not PR shots. This is the one that surprised me the most because when I saw the colours, I immediately thought that it wouldn't suit me, but I actually think that it looks really good. I never in a million years would have even thought to buy these colours separately never mind put them together - but they really work. I don't do 'day eye shadow' because I can never usually make it look subtle. This is perfect - a sweep of vintage peach and a line of coffee liqueur is all it takes to brighten eyes for a perfect day time eye. By far the easiest of all 4 looks is this one. You just use the 2 chunky pencils along with the black kohl and it takes seconds to create quite a powerful smoky eye. 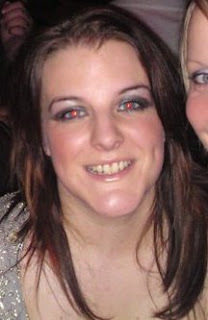 Finally, this is me rocking the 'Almond Eye' on Friday night (apologies for the red eye!) In the excitement of actually leaving the house without children I forgot to take a close up of the make up but I'm sure you get the gist by now! In short, if you love smoky eyes but you're crap at doing them then buy this set. It's really easy to use, it has everything you need to complete each look and there are simple instructions to follow for each look... If I can do it then so can you and it only takes a few minutes! You HAVE to get one of these if you are going out over Christmas. This set is only £22 and when you think of how much all of this stuff would cost to buy individually then it's a really great deal (and I happen to know that these are part of Boot's 3 for 2 offers over Christmas). GO, GO, GO! If these looks aren't really for you though, then take a look at some of Front Cover's other sets - there are plenty to choose from and I'm sure they're just as fab. Ooo I like!! This is just the thing I need! !